One of the best ways to change the food system on a large scale is to change the way the government spends its food dollars. Two years later, they have tested the program and made it replicable to places like, oh, the City of Long Beach, let’s say! The Los Angeles Food Policy Council did the heavy lifting — they lead a broad coalition to establish the philosophy, planning and execution for a good food purchasing policy: they have rated over 2,000 farms in the local food-shed on five dimensions: labor practices, sustainability, locality, humaneness and healthiness. Connect the LA Food Policy Council with Long Beach Unified School District’s Nutrition Services Department to do a baseline assessment of the School District’s food purchasing. 1/14/15 Met with Broc Coward of Councilmember Suja Lowenthal’s office to discuss the Good Food Purchasing policy. Coward suggested we meet with the Department of Parks & Recreation who is distributing over 120,000 meals every summer. 1/30/15 Visited Cabrillo High School’s lunch room and student store and spoke with staff about barriers to better food. The lunch room suggested we work with Nutrition Services. We also learned about what’s popular and how kids select items. 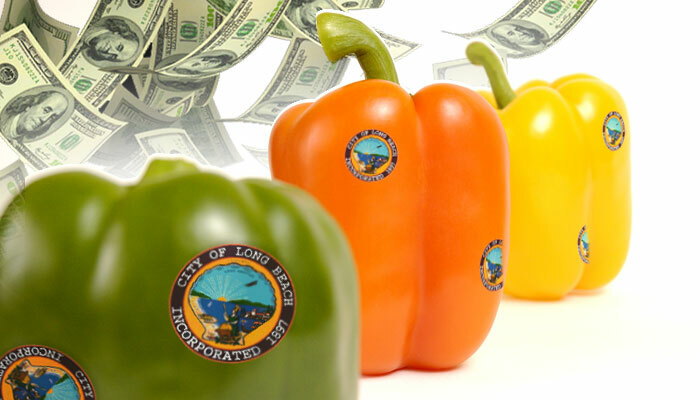 3/6/15 We received the food procurement dollars expended by the City of Long Beach by Department. We are excited to learn that the Departments of Park, Recreation and Marine and Human and Health Services are the largest purchasers of food. 4/30/15 Met with LBUSD Nutrition Services to discuss and prepare for our discussion about the Good Food Purchasing Policy. We answered questions regarding other organizatons working on baseline assessments including the Oakland School District and Google’s main campus in Silicone Valley. 5/1/15 Met with LBUSD Nutrition Services to discuss the good work they’re doing and their openness to work with Long Beach Fresh on an internal baseline assessment with our counterparts in Los Angeles. 5/28/15 LBUSD Nutrition Services took 10 food access community partners on a tour of the centralized food production facility where lots of Long Beach school food is produced. 6/24/15 Met with LBUSD Nutrition Services director and purchasing staff and the Center for Good Food Purchasing, and agreed to move forward in a baseline assessment of food procurement this summer. 6/26/15 Met with RUSD Nutrition Services director Rodney Taylor to learn best practices for good food procurement in schools and potential for the school district to become a food hub. 7/23/15 Established a deadline of October 8th with LBUSD to acquire data from distributors for baseline assessment of food procurement. 10/11/16 LBUSD announced new changes to school food, including an effort to cut styrofoam, diversify food options, and begin serving more cut fruits and veggies to students. 11/3/16 LB Fresh contracts a new Good Food Procurement Program coordinator to focus on carrying the efforts forward with more buy-in from City staff and large institutions. Read the latest status, think about how you want to get involved, and contact us.